London has 6 major football stadiums, 1 for the national team and 5 for the premier clubs. The nearest tube stations for each stadium are Wembley Park, Fulham Broadway, Putney Bridge, Arsenal, Tottenham Hale and Upton Park. Here we have a question: Which station minimizes the total (or average) time for all 6 stadiums? In other words where should you find a flat as a football fan? King's Cross St. Pancras would be the best benchmark, the only largest station into which as many as 6 lines come. Is there any better answer? 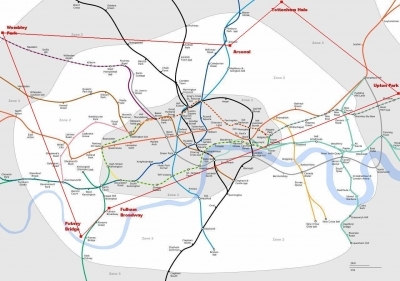 The optimal solution would be some transfer station in travelcard zone 1 and maybe on Victoria or Piccadilly line. You can even mathematically say it must not be far from the centre of the hexagon. 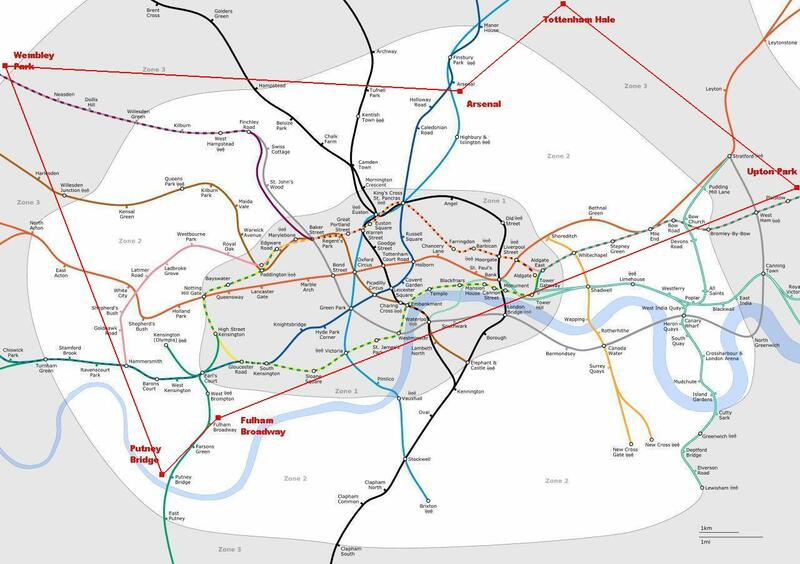 More theoretically, if you get to Arsenal and Tottenham Hale in the north-east, you have to stop at King's Cross; to Fulham Broadway and Putney Bridge in the south-west, at Earl's Court. Piccadilly Line is the direct and shortest line that connects King's Cross and Earl's Court. Just in the middle of them is Green Park, which is also on the Victoria line. I calculated time distances from all possible stations to each stadium by the TFL Journey Plannner, choosing the fastest route from the options. Finally I found that the unique optimal solution is, as was expected, King's Cross, which takes only 19.7 minutes on average to a stadium. For the detail see the table below.